Sad as it is, I know that I’ll never make it up to space during my lifetime. That isn’t to imply my health is failing; more my wallet. But if Europa Report has taught me anything, it’s that I no longer think my penchant for discovery outweighs my complacency for comfort and survival. And it speaks more to the film’s unwillingness to get goofy and melodramatic than my unwillingness to put reward before risk. At least I’d like to think so. It’s been almost a year and a half since we first saw anything about Ecuadorian director Sebastian Cordero’s mysterious first English-language film, and between that point and actually watching Europa Report just earlier, I allowed the film to become vaguely monolithic in my head. I allowed the blurbs in the trailer to loom large in my memory banks, almost cementing the film as a genre neo-classic before I had even put my eyes on it. Such was my hope. 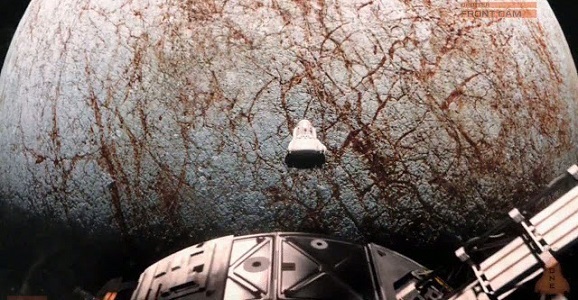 And while I have no idea what kind of movie would have stood up to said hope, Europa Report makes a convincing case to be one of, if not the best science fiction movie of the year thus far, though my enthusiasm will no doubt wane once the latter half of the year’s bigger releases come out. Because it isn’t that a lot happens during Europa Report, but almost everything that does happen means something, even if it’s just a character recording a message to send back to their family on Earth. Six astronauts with differing specialties launch in the Europa One, setting out for Europa, the ice-covered moon of Jupiter long lauded for its potential either to harbor life or have harbored it in the past. It is the job of a lifetime, traveling millions of miles father than any human being before them, with a chance to change humanity’s understanding of life, the universe, and everything. (If this film was missing anything, it was Douglas Adams quotes.) While these characters necessarily can’t be fleshed out in ways that make them complete individuals, there are no black sheep in the bunch. Sharlto Copley plays James, the guy who smiles the most. Daniel Wu and Karolina Wydraplays are William and Katya, the compassionate, mission-minded pilots. As Rosa, Anamaria Marinca plays the wide-eyed explorer, while Christian Camargo’s Daniel seems perfectly happy to do his exploring from inside the ship. Finally, Michael Nyqvist is Andrei, the elder engineer and quasi-father figure. These descriptions aren’t entirely fitting for all moments in the film, but there’s not much else to say without spoiling a few things. My main problem with the film is the odd way it jumps around the time frame. It’s very early on that you realize someone has died, even though they don’t actually die until much later in the film, and then it jumps forward in time again. Yes, there are constant time-stamps alerting viewers to when things are going on, but the back-and-forth completely took me away from thinking of this as documentary evidence. And I know it isn’t, but it’s obvious Cordero intends for viewers to take this viewpoint. But it does feel like genuine evidence throughout most of the film, and there’s an exhilaration felt that no mere found-footage movie could ever hope to elicit. (Perhaps the first monster shot in Cloverfield matches up, but certainly not the rest of Matt Reeves’ film.) When the crew saw unexpected things, I was just as shocked as they were. When crises broke out, I felt as if my life was also hinging on disaster. And what could possibly be more intriguing than exploring something that no human has ever seen before, and assumedly won’t be in any hurry to get back to? Perhaps comparable only to the ocean-conquering explorers from centuries past, the crew of Europa One travel through completely unpredictable areas, only to find their final destination is far more complicated than they ever could have imagined. And not a single wide shot is needed. One of Europa Report‘s unspoken characters is composer Bear McCreary’s subtle but effective score, which also defies any documentary predispositions, but is a welcome presence throughout. Viewers’ emotions aren’t guided so much as they are justified. This is the rare film where I wish a sequel was already in the works, knowing full well how utterly awful an idea that would be, and that I would complain endlessly would it actually happen. But when the credits rolled, I wasn’t ready to leave this universe, and I would do almost anything to go back into it. Except, you know, risk my life or something. I think your review is just about spot on. The movie is only an hour and a half with the credits and could have used another 15 minutes to add some depth to the abrupt feeling story. I also had a bit of trouble with the fake video glitching and HUD overlays, etc that came off as mockumentary pretentious. A proper crew would have been much smarter, versatile, and better prepared for contingencies than the crew in the movie. It was difficult to reach and hold a proper suspension of disbelief throughout the movie but in the end it was a very worthy effort and I appreciate it. — Dan Fogler popping up was a bit of a surprise and also added to a ruined suspension of disbelief for me because I consider him to be an unused comic genius of sorts. He had the lead roll in the underrated movie Balls of Fury (2007) and had one of the funniest lines in a comedy I’ve ever heard when talking about women’s magnificent backsides in Good Luck Chuck (2007). — Anyway, I think Europa Project rates up there with Moon and Primer as a minor victory in small and smart science fiction movies. Nice -agreed re: Moon and Primer, excellent and thoughtful flicks…great seeing the genre get some intriguing additions like this. I’d have loved another 15-20 min as well to flesh out the story. But I’m not seeing examples of a poorly-trained/novice crew: They each demonstrated/applied their specialties while under pretty burly pressure, and until the end where the escalating tension would’ve affected the most battle-hardened person imaginable, they keep level and professional (for the most part). When a crew member faces death, the crew moves (again, for the most part) in the direction of the greatest good. I thought their mileage and experience showed pretty well. Wasn’t Rosa (Anamaria Marinco) the pilot, not Katya as this article states? Maybe I’m confusing names/faces. Cheers and thanks for nicely-done review. There’s nothing more irritating than space films where supposedly brilliant, highly trained professional astronauts and scientists act like complete unhinged idiots…sometimes even before the bad stuff starts happening. Awesome movie! I loved it. I would go in a second on this mission even knowing it would cost me my life. Hey, I’m 60.